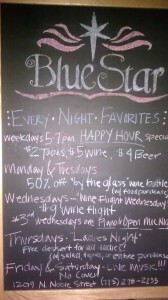 Blue Star has a great variety of tasty wine and daily specials. I recommend choosing your own flight for $16 which equates to three generous pours of whatever you fancy. The Gruet NV Sparkling bubbly, Calina Chardonnay, and 14 Hands cabernet sauvignon were all great fun for those who like to dabble with an assortment of flavors. The wine, live music cover guitarist, and fireplace make this Spanish inspired wine bar toasty & fun despite the disappointment I incurred after learning they were out of the truffled lobster small plate. Blue Star earned appreciation in vegetable availability and creativity. The salads were large, and the chef was flexible about the ingredient swaps and dressing on the side requests. Thick, perfectly tender zucchini ribbon “spaghetti” was a delicious alternative to the usual accompaniment for our Seared tuna steak entrée. 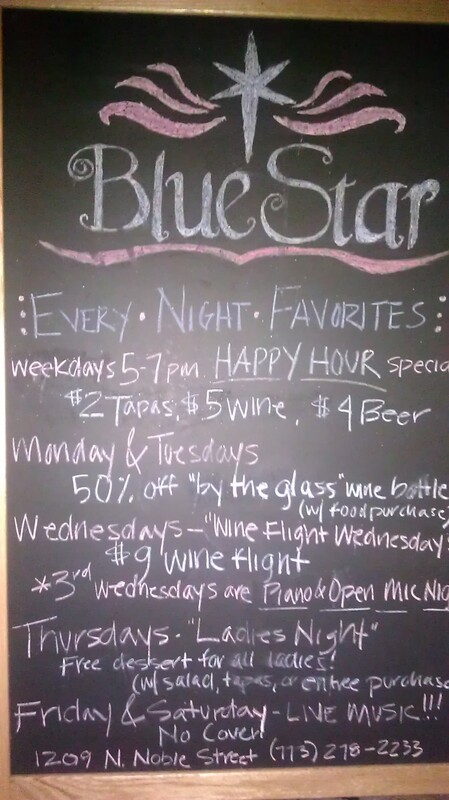 Most enjoyed their meal here and I would recommend Blue Star Bistro for a cozy, casual date night or small group. As a larger party the manager was incredibly kind and accommodating, but service took a while to warm up. Cholesterol: What is keeping your levels elevated? Could you be your own worst enemy?